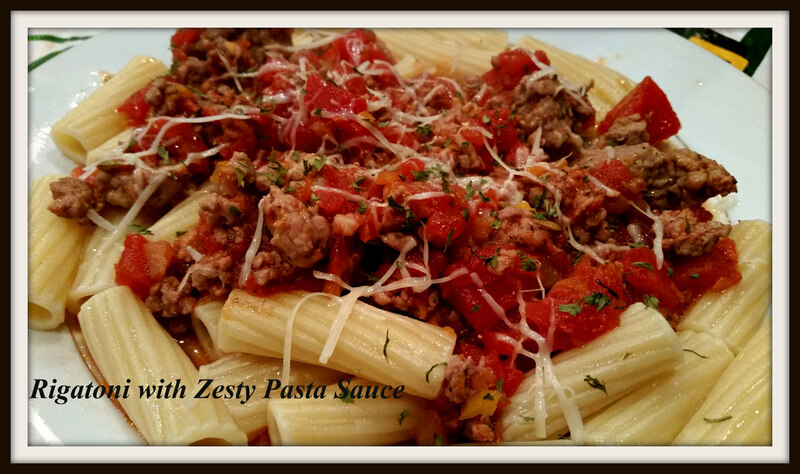 Rigatoni with Zesty Pasta Sauce – What's for Dinner Moms? St. Patrick’s Day (week) is now over. My daughter and I have been gone most of the past week so she could dance in nursing homes, schools and a few bars for charity. It was fun but TIRING! I never seem to sleep well in hotels and we were eating out every day so my stomach hated me for days. But, it made her happy and that’s what we do sometimes as parents. I love how happy dancing makes her. So, as you can guess dinners, if they have not been eaten out over the last few days, have been quick and simple. This meal was on the table in about 45 minutes and seemed really elegant and hearty all at the same time. This meal was delicious. Both kids like the sauce because it was thick and chunky. I liked that I was able to get some carrots in there and no one even noticed. Not even me! Make the sauce as flavorful or as spicy as your family likes. Use hot, spicy sausage and extra red pepper if you like it really spicy. Or, use a mild sausage with more oregano and less red pepper flakes if you family does not like spice. Make it so your family will love it! I served this with green beans, a green side salad and some crusty Italian bread, warmed. A perfect meal. For my mostly gluten-free son I served his over gluten-free pasta. The rest of the dish is gluten-free as long as all your ingredients are gluten-free! In a large skillet over medium heat, cook the onions and carrots in the olive oil. Cook until the vegetables are soft, about 10 minutes. Add the sausage, oregano, red pepper flakes, salt and pepper to the skillet. Cook stirring often until sausage is fully cooked and broken into small pieces with your spoon. Add the wine to the pan and stir any browned bits of sausage or vegetables from the bottom of the pan. Add the tomatoes with the liquid from the cans and simmer for 20 minutes. Taste and adjust spices to your liking. While the sauce is simmering make the pasta according to package directions. When pasta is cooked reserve some of the pasta water to add to the sauce. Toss the sauce and serve over pasta or mix with the pasta. Garnish with cheese and parsley if desired. Mine is about getting me to just eat vegetables! Nothing beats a good home cooked meal, and this looks wonderful 🙂 . I like zesty! Looks delicious… I can just smell everything bubbling away! Thank you! It is spicy if you use hot Italian sausage and red pepper! This looks fabulous, I could gobble this up right now! Miam, miam! My family would like this. I wonder if I could sneak the carrots by them? Will have to try it and let you know. Dice them fine enough and you can barely even see them! When my oldest was still at home I would puree the onions and green herbs so he wouldn’t notice them. Both my children are picky eaters. Big Baby Boy still doesn’t like onions! I thought for sure his tastebugs would change and love them by now. He’s in his 30’s. Especially since all the sauces he loves are flavored with onions, and probably carrots, and celery. A Chef’s favorite aromatics and flavor enhancers. My daughter can spot an onion at 100 yards! She will eat them if she can’t see them but the intended she spots one she is done. OOOH I love a big and chunky sauce myself! It was nice and spicy!